When she arrives at work Sandra must first proceed to the employee area where her personal belongings are stored in a locker during her shift. The purse she carries to work is made of transparent plastic, allowing everyone to see what is inside. Once she has passed through security and stored her belongings, Sandra dons the uniform she must wear while dealing blackjack. The uniform is mandatory for all blackjack dealers and serves an important purpose. It immediately identifies her as a blackjack dealer to the security personnel who watch the entire casino on closed-circuit monitors. Once she has her uniform on, Sandra joins the other dealers working her shift for a meeting with the shift supervisor. In this meeting, Sandra and the other blackjack dealers will be informed on any specifics regarding their shift. They will be told which dealer is giving breaks, the table where they will begin their shift, and various other details. 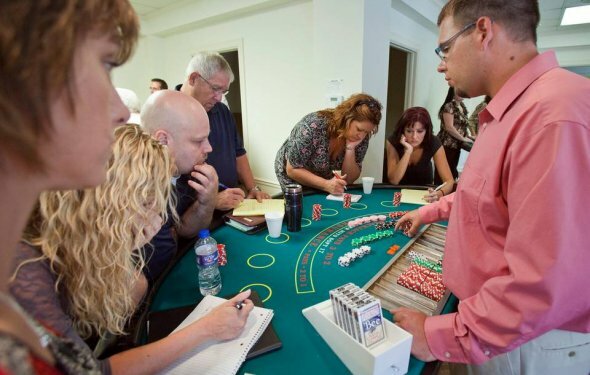 Once the meeting is over, Sandra and her co-workers proceed to the blackjack pit and begin their shift. Sandra finds her and walks up behind the dealer who is already there. She taps them on the shoulder to alert them their shift is over and assumes the dealing responsibilities at the table. With a clap of her hands to show that they are empty, Sandra begins to deal the next round of cards. For the next 8-12 hours, Sandra will be dealing hand after hand to an ever-changing group of blackjack players. There will be loud players, quiet players, drunken players, nice players, and irritable players. Throughout it all, Sandra will smile and keep the blackjack game flowing smoothly. Her feet often hurt from standing in one position for so long. She finds herself on the receiving end of verbal abuse when players lose and glowing praise when they win. Believe it or not, Sandra hopes they win. When players win, they tip the dealer. Tips account for a large amount of Sandra’s salary. Once every hour Sandra is moved to a different blackjack table, and after a few hours in the pit she is given a break. This routine continues until Sandra feels that tap on the shoulder which tells her that the shift is over. Sandra takes her “toke box”, the locked box containing her tips, and leaves the blackjack pit. Once she has completed her paperwork and everything has been approved by a shift supervisor, Sandra cashes in the chips that players have given her in tips. She changes back into her street clothes and discreetly leaves the casino in the company of a security guard who sees her safely to her parked car. Sandra returns home, tired but happy with the money she has made. Tomorrow everything starts all over again. With a few exceptions, Sandra’s story represents the life of blackjack dealers everywhere. It is a tiring and often thankless job that dealers do. Most of them do it because they love the work and the money they can make from dealing blackjack. Before someone can become a casino blackjack dealer, they must undergo a significant amount of training. During this training they will learn all about the game of blackjack. New dealers will be taught the rules of the game, the authority structure of the blackjack pit, and how to spot card counters. V.I.P. Casino: Blackjack is a WiiWare blackjack video game developed by High Voltage Software. It was a launch title for the North American debut of the service on May 12, 2008.